Continuing a 119-year-old tradition, Dartmouth will celebrate its alumni and welcome new students to the institution during the annual Dartmouth Night and Homecoming, to be held this year from October 17–19. First held on September 17, 1895, Dartmouth Night was introduced by President William Jewett Tucker to give the College a day to invite alumni back to their alma mater and to unequivocally celebrate their achievements. It was an immediate success. On that first night, alumni, faculty, and students gathered in a historic building called “The Old Chapel,” which was decorated for the occasion with paintings of famous alumni such as Daniel Webster, Class of 1801, and Thaddeus Stevens, Class of 1814, and the founder of the College, Eleazar Wheelock. 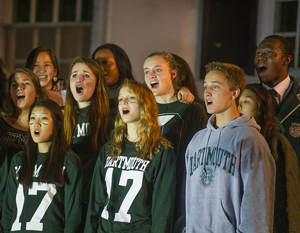 Members of the Dartmouth College Glee Club sing during 2013 Dartmouth Night and Homecoming. Photo by Jeff Woodward. Dartmouth Night wasn’t publicly associated with football until 1923, when the new stadium—Memorial Field—was dedicated. 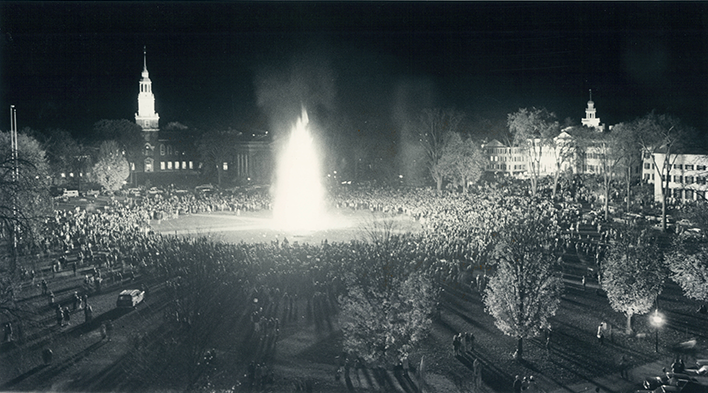 The event was referred to as “Homecoming” in The Dartmouth for the first time in 1961. Up until then it was referred to as Dartmouth Night. If Dartmouth Night was called “Homecoming” in 1895, it would be the earliest such gathering—preceding schools such as the University of Missouri and Southwestern University. Just as they do today, the president and prominent alumni spoke, and the Dartmouth College Glee Club sang. Nine speakers, including judges, a congressman, a prominent doctor, and law school student M.B. Jones, Class of 1894 took the stage. (Jones was asked to represent the younger alumni.) President Tucker read four letters of regret, including one from the editor of the New York Times, Charles R. Miller, Class of 1872. Of course, some elements over the years have changed—today the speeches are shorter, a parade and bonfire punctuate the evening, and glow sticks occasionally illuminate the night. But what’s remarkable is that core of the event—the spirit of celebrating alumni and new students—has remained so true over the years. View the history of Dartmouth Night through the decades. View the 2014 Homecoming Weekend schedule.